ds, AL - Your book touched me and I just wanted to let you know that I really did enjoy reading it and I know I will read it again and again. Your words are very touching and I just wanted to thank you. mf, FL - I'm honored to have this book and will continue to refer to it often. You express feelings I've had but were unable to understand. ay, FL - I've known elusive feelings all my life that I never understood until I read To Feel The Song of Seasons. My tears today are because of the wondeful feelings your words reminded me of. bl, GA - It's good, really good. I have no time to read for pleasure but because the book was a gift I gave it a read. It was a gift indeed. I found myself alive in memories. Reading the book was a true gift to myself. cr, TN - I see myself in it. I read it from beginning to end and really saw the story the author tells you to look for. It is my story in love. It is my story in hurt. It is my story. cy, NJ - Buy the book. If you have ever felt love then read the book. pl, NY - It will be a classic I know. The kind of book that rests between each reading to deliver a fresh new message each time it stirs a memory or touches a desire. pp, AL - Now there's no reasons for me to write my own story, dl spoke to me and through me in To Feel The Song of Seasons. I found myself in his book. I could never have found the words to say it like he says it. 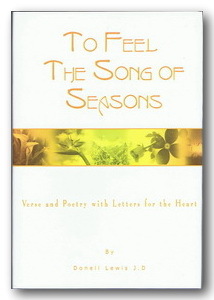 To Feel The Song of Seasons!